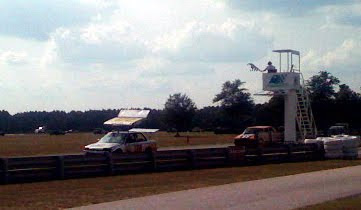 With the density of cars on the track thinning due to attrition, the racing got a little more fun. Fewer cars meant more opportunities for clear track and getting some fast times. Jeff garnered some battle damage during his stint when the vorpal rabbit sunk his teeth into the side of Our Lady in turn 1. Fortunately they only black flagged the rabbit and Jeff was able to finish his stint. The Civic, however, will carry the scars by which to remember the encounter. Our only problem came when Craig noticed that the car made some scraping noises when turning and brought the car in. Turns out that the bolts that secured the mount to the engine on the other side were loose and one had fallen out. Another few minutes and we may have had a dramatic failure. We also had a bit of fun with the Tunachuckers. It turned out that they could hear our radio communications going back and forth and particularly enjoyed the air traffic control lingo that we were using. At the end we managed to keep the car on the track for most of the race and finished ~150 laps behind the leader. Not too shabby considering that we had a couple of long unplanned pit stops and that our pit strategy was optimized for driver entertainment and not focused on the win. Our disappointment came at the awards. We felt like we had the Dangerous Homemade Technology award in the bag. The wing seemed to be a big hit with the crowd and it was pretty cool to watch on the track as it lowered on the straights. We even thought we might have had a shot at organizers choice since we had gone the extra mile with the costumes. In the end we missed out on both. Jay gave us a mention during the awards ceremony but ultimately gave the Dangerous Homemade Technology award to a team that had built electric brake coolers (presumably thermoelectric and not just fans). I can only guess that Jay had already seen enough active aero to want to give the Dangerous Homemade Technology to something a bit more unique.